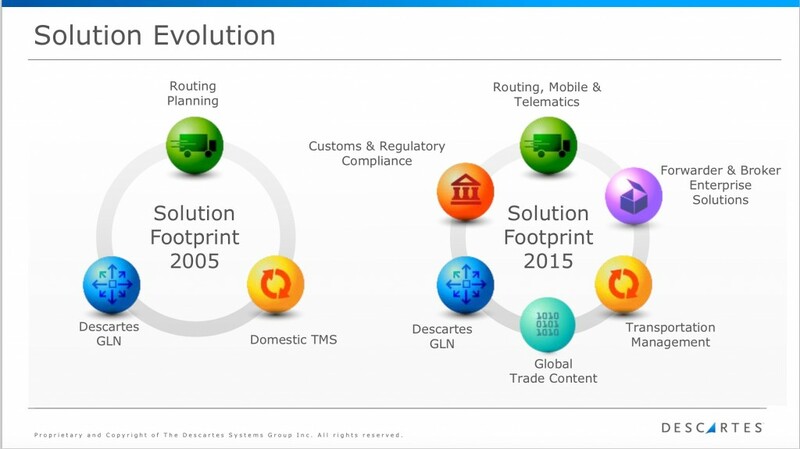 The theme of this year’s Descartes Evolution 2015 Global User & Partner Conference, held in May in Miami, Florida, was “Logistics Integration — What’s Next?” It was an appropriate theme for Descartes, a company that has grown and evolved its solution footprint significantly over the past decade, with 28 acquisitions since 2005, including 7 acquisitions since the last user conference in 2013. The slides below from CEO Ed Ryan’s keynote presentation highlight the current scope of Descartes’ solution footprint, which includes both software applications and its Global Logistics Network (GLN) — an example of what I call a Supply Chain Operating Network. I had the chance to interview Ed Ryan while at the conference and below is a short clip where he discusses two important acquisitions in the past year — Airclic and Customs Info — and the value they bring to customers. I also asked Ed what industry trends and customer requirements are shaping Descartes’ strategy, and not surprising, omni-channel retailing topped the list, along with customs and security filings. Same-day/home delivery is a hot segment of omni-channel retailing and one of the best customer presentations at the conference was from Sears (actually, Innovel, which is part of Sears Holding Corporation and operates as a 3PL for Sears and Kmart as well as external companies such as Lands End). Joe Macro, Director Network Planning and Analysis, and Steve Rutkowski, Director Logistics Systems from Sears provided a very detailed overview of the company’s journey toward becoming, as they put it, “the UPS of Big Box” — in other words, Sears is aiming to provide the same level of service for big box orders and deliveries (such as appliances, lawn and garden, and furniture) that consumers have come to expect with small parcel orders and deliveries. Sears makes over 4 million deliveries annually, with about 1,000 trucks on the road every day, and 85 percent of orders are delivered within 1-2 days. Enabling customers to select delivery date and appointment time at the Point of Sale is a critical goal, and it requires providing customers with profitable choices derived from continuous optimization and enhanced capacity planning capabilities. Sears is leveraging mobile technology that allows its team members to document delivery status without a call; use mapping/Google directions; and take pictures and document issues. Sears has a “fanatical focus” on customer satisfaction and Net Promoter Scores. Important metrics include On Time Delivery from a customer’s perspective; Team Performance in the home; and Point of Sale experience. Analytics on historical data helps Sears understand how operational decisions impact customer satisfaction and the delivery experience. To date, Sears has increased truck productivity by 2.8 percent, decreased miles per stop (MPS) by 5.4 percent, decreased address corrections by 25 percent, and reduced full time equivalents (FTEs) by one third — all resulting in about $3 million in annual savings, with additional savings and benefits on the horizon as additional capabilities are implemented. In the video clip below, Chad Murphy, VP of Professional Services at Descartes, shared with me some best practices he’s seeing from other customers in the realm of omni-channel fulfillment and same-day delivery. 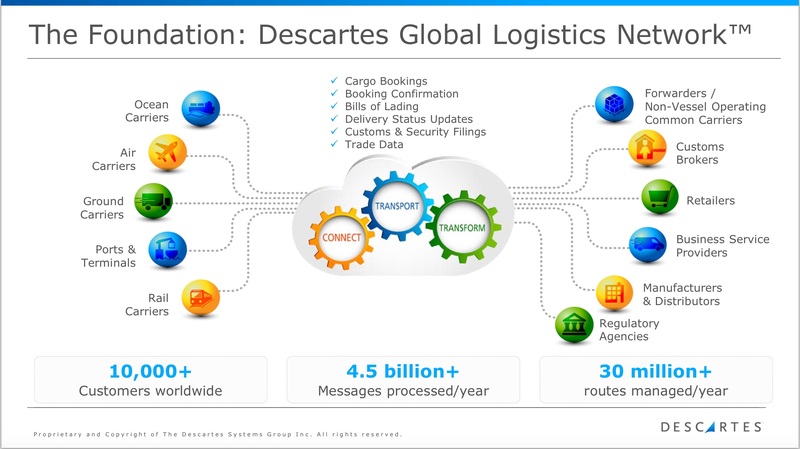 “Efficiency gains now live at the intersection of processes, parties, and systems,” he stated, “where sometimes 1+1 can equal 3.” I asked Ken to explain what he meant by that, which he does in the clip below, giving examples of private fleet and for-hire carrier integration and warehouse management (yes, Descartes has a WMS solution) integrated with its final mile dynamic scheduling solution. In essence, the “1+1=3” opportunities Ken discussed echo what I’ve been hearing lately from other solution providers — that is, advancements in technology (including cloud, mobile, and BI) are enabling companies to take a smarter, more integrated approach to supply chain and logistics planning, execution, and analysis, which ultimately results in greater benefits than treating each process in isolation (see The Case for Less Silos, More Intelligence in Supply Chain Management and A Case Study in Closed-Loop Operational Management). I encourage you to watch the complete interviews with Ed Ryan, Ken Wood, and Chad Murphy for additional insights on industry trends — including the ongoing evolution of transportation management systems and what’s new in the customs and security filings world — and how Descartes and its customers responding. What are some “1+1=3” opportunities in your supply chain? What’s preventing you from going after them? If not now, when? Post a comment and share your perspective on this topic!